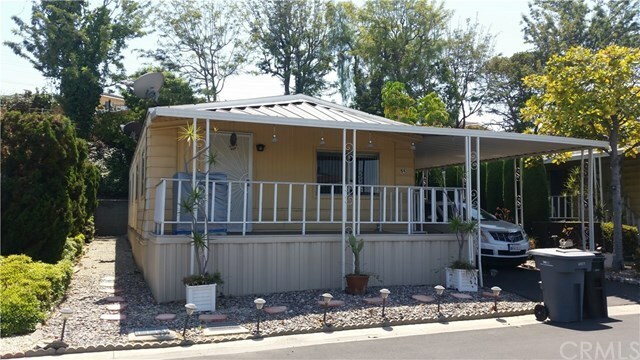 26200 Frampton Avenue, Harbor City, CA.| MLS# SB18211928 | Southern California Homes for Sale. Search properties Southern California. PRICE REDUCED BY $10,000. SELLER READY TO MOVE but firm on price now!! #56 Needs Your Personal Touch to finish out this HUD Unit on REGISTRATION NO TAXES. Does have 2017 NEWer Roof, NEWer Furnace & AC. NEWer Carpet Installed. Master bedroom has own bathroom and Walk-In Closet. Kitchen is square layout and needs finishing or your vision. ENJOY QUIET LIVING located in the Palos Verdes Rancho MHP which is for Senior Living of 55 years and over. This community is under City of Los Angeles Rent Control CPI. 2 Bedroom and 2 bathrooms with inside laundry area. Appliances stay with unit. Carport has room for 2 vehicles and one shed on the property. Front porch is comfortable to enjoy the morning sunrise or afternoon sunset. #56 for sale with 1,120 sq. feet at 20 x 56 - Space rent for new buyer $925. Cook up a bbq dinner at the community gas grills and enjoy a dip in the heated (during summer) salt water pool, or enjoy the sauna. Schedule an activity at the clubhouse for an event at no charge. Community is gated at night time with security cameras around the clubhouse area and front gate. Manger is always out and about overseeing that the community is kept clean, so call her for an appointment to introduce yourself or get some answers to your community questions. Buyers need to have a income of 3 times space rent income (state rule) to qualify for park residency. (buyer needs Verifiable min income per month $3,00). Buyer to verify all information taken from title.